(L-R) Michael McDonald, Chief Technician, School of Arts and Humanities, Dario Sinforiani, Head of Production Teaching, Yana Ivantcheva, Tommaso Aglietti, Derek Sigurdsson. 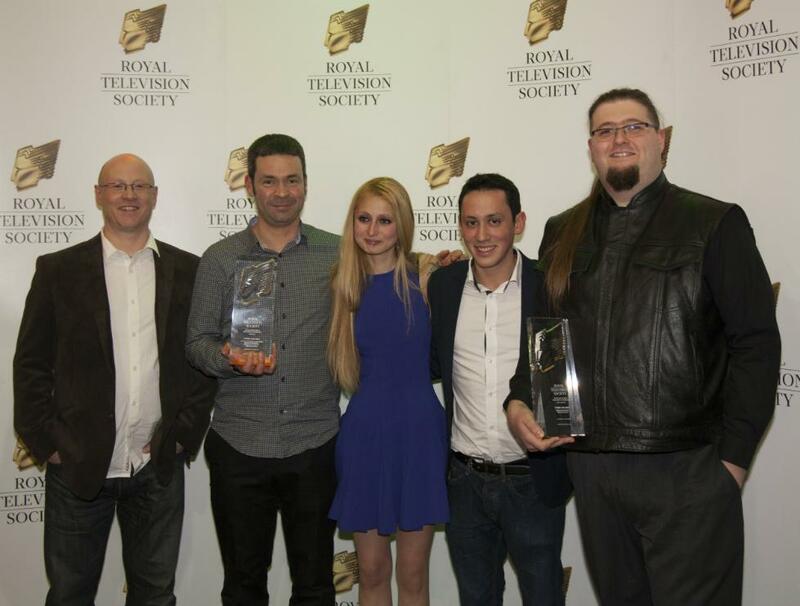 Students from the University of Stirling’s Communications, Media & Culture Division are celebrating a triple win at the Royal Television Society (RTS) Scotland’s annual Student Television Awards. At BBC Scotland’s Pacific Quay headquarters in Glasgow, Stirling students scooped the best factual crown, as well as craft excellence awards in sound and editing, making Stirling the most successful university on the night. Three Stirling films – ‘Under the Skin’, ‘Beloved Sinners’ and ‘A Life to Give’ - comprised the entire factual category shortlist. A jury led by former STV executive Henry Eagles selected ‘Under the Skin’, in which the anonymous central character describes the harrowing details of life with an eating disorder, for the award. The team behind its success comprised: Yana Ivantcheva, Josh Bird, Derek Sigurdsson, Tommaso Aglietti and Philip McVeigh. Tommaso Aglietti, ‘Under the Skin’s’ co-producer, said: “I didn't think many people were going to see our documentary, let alone that it was going to win such a prestigious award. Fellow ‘Under the Skin’ producer Yana Ivantcheva said: “This win means I've accomplished a dream, that work I've put my heart and soul into has been recognised and proved meaningful for the judges. The annual awards are open to undergraduate television students across Scotland. In addition to factual, animation, drama, comedy and entertainment categories, craft excellence in camera, sound and editing was recognised this year for the first time. David Kotai won for Stirling with his sound work on ‘Beloved Sinners’ and Derek Sigurdsson and Phil McVeigh triumphed with their editing of ‘Under the Skin’. Derek Sigurdsson said: “The staff really helped a lot, answering all my questions and guiding me through the classes and work. It means a lot to me winning this award because I am a very tough critic of my own work. Dario Sinforiani said: “I'm delighted that the talent and hard work of our production students has been recognised by industry at these prestigious awards. “It's great to know that the best student factual production is being made at Stirling, and to win two of the three craft awards is an amazing achievement. Hopefully this is just the start for our winners and nominees, and they go on to successful careers in the media industry." Richard Downes, BBC Series Producer and RTS Scotland Juror, said that both the mature handling of sensitive subject matter and the impressive access secured set the three Stirling factual films apart. On the stand-out ‘Under the Skin’, Richard said: “Tackling the difficult and painful subject of anorexia, this film demonstrated real flair. Stylistically arresting, the choice of a single interviewee to describe her journey from teenager to crisis point, packed a powerful emotional punch. The result was a revealing and compelling watch." The Royal Television Society (RTS) Scotland’s Student Television Awards were held on February 5. ‘A Life to Give’ offers a revealing insight into the world of surrogacy, as told by those involved. It was made by: Ewan Diack, Mark Ferguson, Amanda Taylor and Stephen Burton. ‘Beloved Sinners’ is a visually lyrical observational documentary on the monks at Pluscarden Abbey, home to Scotland's last surviving Benedictine order. The team behind it was: Ehssan Shamoradi, Magnus Rasmussen, Rajmund Bakonyi and David Kotai. Photo titled Film awards.jpg shows (L-R) Michael McDonald, Chief Technician, School of Arts and Humanities, Dario Sinforiani, Head of Production Teaching, Yana Ivantcheva, Tommaso Aglietti, Derek Sigurdsson. Stirling is ranked top university in Scotland for communication and media (Complete University Guide 2015) and it sits in the top 150 universities worldwide for Communication and Media Studies (QS World University Rankings for 2013/2014). The Communications, Media & Culture Division’s strong relationships with screen industries, public relations and journalism professionals - including alumni - are among its core strengths. Its research arm, the Stirling Media Research Institute, is internationally renowned. The wide choice of options in taught graduate and undergraduate programmes, plus doctoral research, includes theoretical study in the field of media and culture, as well as vocational work on the media, communications and journalism industries. Undergraduates can choose to include radio, television, print and online journalism practice modules in their study programmes.